A young woman lies in a hospital bed, comatose, exploring a surreal fantasy world in her slumber, trying to find her way back to the real world, where three old school friends attempt to unravel the mystery of how she ended up in such an unfortunate condition. Sounds like a pretty solid premise for a feature film to me… but apparently Ch4 thought it would work better as a sitcom! The pilot for Coma Girl aired last night, as part of the Comedy Showcase series, and frankly I found it deeply underwhelming. I’ve never been a fan of the theory that comedy scripts should have two laugh-out-loud jokes on every page… but I barely chuckled at all watching this show. It’s the sort of “gentle” observational humour where an old woman repeating the same banal comforting words four or five times in succession qualifies as a gag. Meh. With a female writer/creator, and an all-woman ensemble, I really wanted to like this show… but there was nothing here to really hook into. It was all very bland. 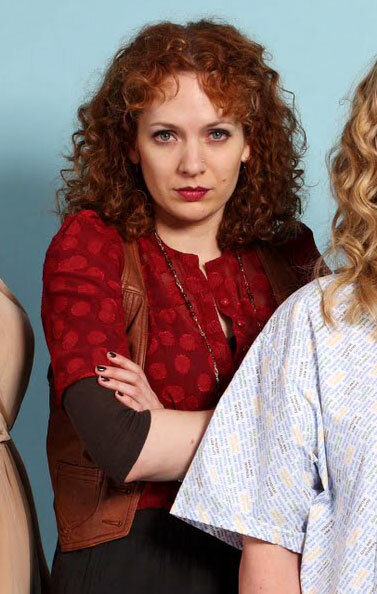 It’s also rather disappointing to see Katherine Parkinson spinning her wheels in yet another unrewarding group effort, rather than storming into the spotlight as the headlining star. She has the talent, she has the looks, and she has that gorgeous voice… why isn’t she getting more screen time, dammit? This entry was posted in Rants about TV and tagged Coma Girl, Katherine Parkinson. Bookmark the permalink. although I found Coma girl quite entertaining and interesting as a comedy show pilot, I’m with you about KP not getting the kind of roles she deserves. I’d love to see her in a show where she is THE star for a change!